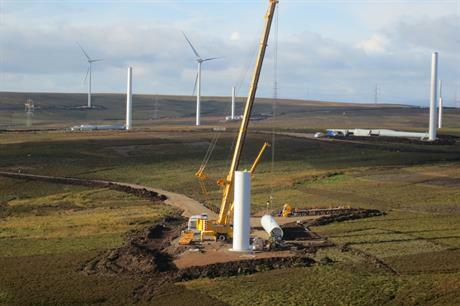 UK: The prospects for wind power in the UK, in the short term at least, look reasonably promising. That might seem to fly in the face of recent evidence - the coalition government's enthusiasm for shale gas exploration, its decision to invest in new nuclear power stations with an extremely attractive guaranteed price for the energy supplier, and prime minister David Cameron's avowal to "get rid of all the green crap" to cut consumer energy bills, a political hot potato throughout 2013. But neither shale-gas nor new nuclear capacity are going to be adding anything to the UK's energy mix in the next eight to ten years, perhaps longer. And consumers may be underwhelmed by how little their energy bills fall even after the removal and finessing of a number of green levies and incentives. The simple truth is that if the UK is to get anywhere near its binding 2020 target of delivering 15% of energy demand from renewable sources, it will need more wind power. The UK comfortably passed the 10GW mark in 2013, finishing the year with a total installed capacity of 10.53GW, of which 3.65GW, around one third, is offshore. The 2,060MW of new capacity installed during 2013 is marginally down on 2012's 2,345MW, but well above 2011's 622MW. Despite the high-profile inaugurations of big offshore projects in English waters, such as the 630MW London Array and 270MW Lincs wind farm, most of last year's new capacity was installed onshore and in Scotland. RWE npower's 144MW Fallago Rig and Scottish Power's 109MW Whitelee Phase ll projects were the headline completions in 2013. On the policy front, Department of Energy & Climate Change (DECC) finally published its UK electricity market reform (EMR) delivery plan in December, setting out the strike prices for renewable energy technologies to take effect in 2014. The strike price is the prices that energy producers have been guaranteed by the government, and should the market price fall below that they will receive subsidies. Onshore wind took the hit - the anticipated price of £100/MWh (EUR120/MWh) cut was cut to £95/MWh for the next three years, and will fall to £90/MWh from 2017. Offshore was the beneficiary - the strike price set at £155/MWh rather than the expected £150/MWh for the next two years. It is scheduled to drop to £150/MWh from 2016, and £140/MWh the year after. The wind industry reacted with two faint cheers, pleased that a decision had finally been made, but concerned that the price drop for onshore wind would slow progress, while the price rise for offshore was insufficient to encourage further development. A new sense of reality swept through the UK offshore market in 2013 as a number of high-profile projects came out of the wrong end of the pipeline. As late as the summer, trade association RenewableUK was making confident noises about being on course for 18GW of offshore wind by the end of the decade. That has now been quietly downplayed to 10GW, which still looks a formidable target.